The late, great Andrew Breitbart once described comedian Evan Sayet’s 2007 speech at the Heritage Foundation as “one of the five most important conservative speeches ever given”. Five years later that speech (How Modern Liberal’s Think) continues to receive fresh views. 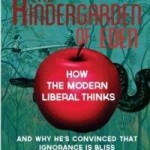 Most recently Sayet has taken the meat of that speech and developed and extended the premise into his first book: The Kindergarden of Eden: How the Modern Liberal Thinks. How many times have you, as a conservative/Republican asked yourself, “What’s wrong with these people? How can they think like this? Are they evil or just stupid?” It seems mind-boggling that the same people who claim to stand for the poorest among us support energy policy that makes it nearly impossible for the poor to afford energy in their homes. It’s confusing that a liberal would be so passionate about defending the “environment” that they would sacrifice hundreds of thousands of African lives just to ban DDT- the “miracle” chemical that nearly eradicated malaria, the number one killer in some African nations. A chemical that has to this date not been proven to be environmentally hazardous. It’s certainly no more hazardous than, say….malaria! Sayet lays out a brilliant answer to these questions and others, step by step. 2)Indiscriminateness of thought does not lead to indiscriminateness of policies. It leads to siding only and always with the lesser over the better, the wrong over the right, and the evil over the good. 3)Modern Liberal policies occur in tandem. Each effort on behalf of the lesser is met with an equal and opposite campaign against the better. My footnote – there is no better or more recent example of this immutable “law” than the recent rukkus over frakking. Liberals continue to advocate for the least effective forms of energy (wind, solar, etc.) while actively working to crush one of the most hopeful (and cleanest) forms of energy mining to come along in a long time – frakking. 4)The modern liberal will ascribe to the better the negative qualities associated with the lesser while concurrently ascribing to the lesser the positive qualities found in the better. My footnote – think Islam as “the religion of peace” versus Christianity as the aggressive and oppressive religion. Applauding yet? That’s only the first page! And to prove this theory, we are directed towards one of the most influential books in modern liberal thought, “All I Really Need to Know I Learned in Kindergarten”. Just days after Sayet shared this theory, the liberal media exploded in panic, ridicule and anger when Mitt Romney (in the first debate with Obama) suggested he would cut funding to PBS. Were liberals angry about the debt, the deficit, rising taxes or how these relate to unnecessary public outlets like PBS? No, their panic and dread was directed toward one subject…Sesame Street. Headlines erupted over Romney’s Big Bird hatred and liberals everywhere were outraged that anyone would consider defunding a children’s show that earns over $200 million/year in sales and copyright revenue. Think about it – most of us grew up with Sesame Street; approximately how old were you when you started moving on from Sesame Street to other interests? I’m guessing it was right around the age of … 5. Exactly the age at which Sayet claims liberals are happy to stop progressing. He nailed it. Sayet claims this is only the first written version of his theory. He plans to flesh out more and expand his argument in the future. As thorough and eye-opening as this short but entertaining offering was, there is certainly a lot left to be explored on the topic, and Sayet seems to have proven himself just the man to do it. “Today we are at a tipping point where the people of God and science will soon be overwhelmed by the demands of taking care of the permanently infantilized. It is unsustainable. If the system collapses under the weight, the future is not merely a slightly less wonderful existence, it is a return to what life had been like for the overwhelmingly majority of people in all other times and all other places…That life was described by Thomas Hobbes as ‘nasty, brutish, and short. We’re not there yet, but we’re close”.